It seems to be the prevailing logic to provide archive links on blogs. In the sense that a blog is sort of an online journal, this seems reasonable, I suppose. I’ve had this feeling for a while, though, that no one really uses these links for anything. How often, for example, does someone go back and review a specific month or day of blog activity? 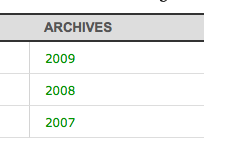 Long ago I abandoned date-based archive links on this site. If you are looking for some of my past blog entries, you’ll have to do it by category or tag. I think that you’ll have better luck finding what you’re looking for that way. To put some meat behind my suspicion, let me refer to Slaptijack‘s usage in 2008. Last year, the site received over 122,000 pageviews. Of those, only 509 were of the monthly archive pages. That’s less than one half of one percent. Does it really make sense to provide all those links for no reason?